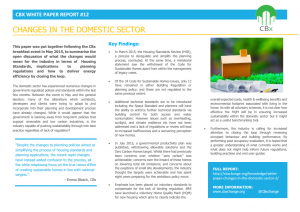 This paper was put together following the CBx breakfast event in May 2015, to describe and explain the recent changes within the domestic sector. Our panel of experts discussed what the changes in May would mean for the industry in terms of Housing Standards and the implications to planning regulations, presented ideas on whether the changes would compromise sustainability, and talked about how we should deliver energy efficiency by closing the loop. Since the CBx event in May, more changes have come to pass within the domestic sector which have been captured in this paper. With special thanks to our fantastic panel of experts; Clare Murray of Levitt Bernstein, Dan Jestico of Hilson Moran and Saryu Vatal of BSRIA.